Here are pictures of the 1999 Suzuki Hayabusa GSX1300R- ‘The Original’ you might say… Unfortunately I don’t have any decent pictures for the original series because the internet was still in its infancy for the general public and unknown to the major manufacturers and digital cameras were still expensive toys. I’m sure the original brochure with the original Hayabusa colour codes! 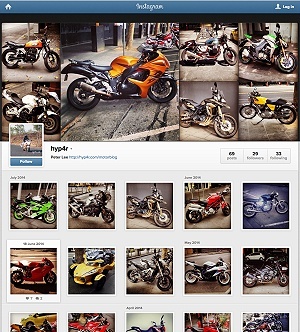 Aside from these there are of course my own pictures of my original Copper Bronze Suzuki Hayabusa in located in the motorcycle pictures gallery – currently linked from the main page. 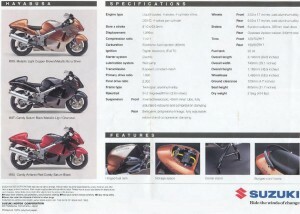 This is part of the Suzuki Hayabusa model history series transferred from the old section of the website.